Can fixator-assisted plating of focal dome osteotomy accurately correct varus deformity in medial compartment osteoarthritis? Large varus deformities in medial compartment osteoarthritis are difficult to correct with lateral closing-wedge or medial opening-wedge osteotomies. They are easier to correct gradually with opening-wedge or dome osteotomies with external fixation. A focal dome osteotomy can support a large angular correction and yet retains good bony contact. It creates a large proximal fragment that allows for better fixation. However, external fixation devices are cumbersome and not well tolerated by older women and those who cannot follow-up over long distances. Fixator-assisted plating of the focal dome osteotomy combines the advantages of the fixator for accuracy of correction and the convenience of the locking plate. 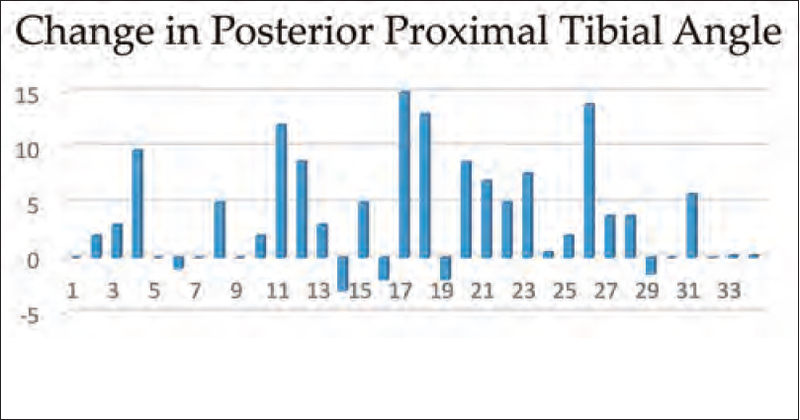 We retrospectively analyzed 34 focal dome high-tibial osteotomies in 31 patients performed over 6 years. 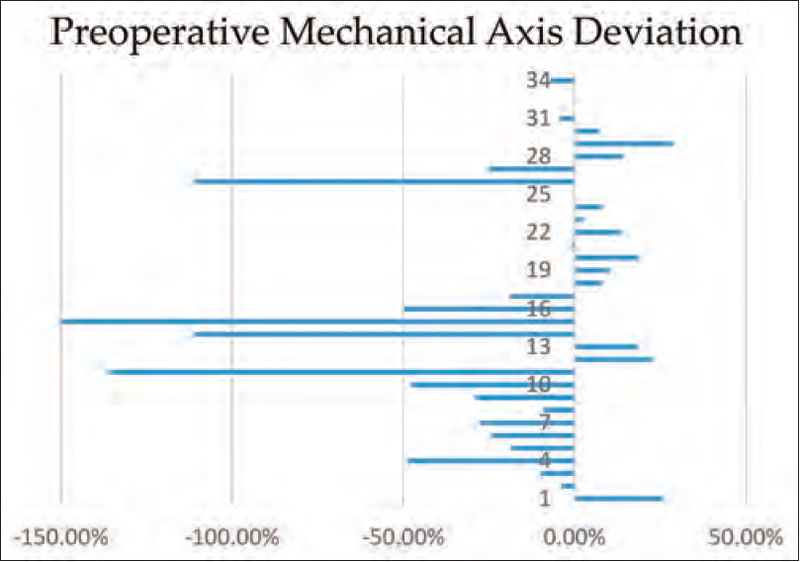 Preoperative mechanical axis deviation was −19% (−150%-28%) which improved to 55% (3%-108%). The average preoperative medial proximal tibial angle was 79.8° (88°-63°) which improved to 93° (84°-107°). The average preoperative hip-knee-ankle angle was 195.2° (185°-225°) which improved to 177.5° (166°-204°). Femorotibial angle was 184.6° (182°-220°) which improved to 172° (158°-184°). The tibial slope reduced from 76.9° to 81.1°. Average follow-up was 70 months (45-113). Large varus deformities could be corrected safely with reasonable accuracy in this study. Accurately correcting the varus deformity and preserving valgus alignment is most important in achieving long-term relief of pain in medial compartment osteoarthritis (OA) of the knee. Lateral closing-wedge and medial opening-wedge osteotomies are popular but may have many complications including lack of accuracy and inadvertent secondary problems. , Lee et al. described a fixator-assisted medial opening-wedge osteotomy fixed with a minimally invasive locking plate. However, the deformities were not large. Paley  described Ilizarov focal dome high-tibial osteotomy at the upper tibial meta-diaphyseal junction, just distal to the tibial tuberosity. It can correct large deformities and has many advantages over the dome osteotomy described by Maquet. Maquet's dome method is performed above the tibial tuberosity with its convexity facing proximally. This creates a small proximal fragment difficult to fix reliably. It causes medial translation of distal fragment which mitigates the effect of lateral translation of mechanical axis achieved by the valgus. The focal dome is performed just below the tuberosity with its convexity downward. It creates a large proximal tibial fragment which is fixed adequately with a circular fixator or a locking plate. The dome osteotomy retains bony contact even after large angular correction. Acute and sustained compression by a fixator allows reliable union. Fixator hinges allow gradual and accurate correction of the deformity which can be fine-tuned to the gait of the patient. Early full-weight bearing mobilization and resumption of activities are great advantages. Its performance in distal harder bone delays union compared with a supratuberosity osteotomy. Younger patients tolerate longer fixator durations quite well, but it tests the patience of older ones. Older women with large deformities are reluctant to accept an external fixator and refuse surgery if it is the only option offered to them. Patients may be unable to travel longer distances for mandatory follow-up care of the fixator. This was our experience after performing Ilizarov focal dome high-tibial osteotomies over 15 years. For these patients, we chose to combine the benefits of the focal dome osteotomy aligned with an Ilizarov fixator with the convenience of locked plating fixation. The Ilizarov fixator was applied during surgery to accurately hold the correction of the focal dome osteotomy. A TomoFix (DePuy Synthes, Mumbai, Maharashtra, India) or locking plate (Uma Surgicals, Mumbai, Maharashtra, India) applied laterally fixed the osteotomy and allowed mobilization. The fixator is removed thereafter, in the theater, increasing the comfort and convenience of the patient. We retrospectively analyzed the accuracy of correction of large varus deformities in medial compartment OA knee achieved by fixator-assisted plating. We treated 34 limbs in 31 patients [Table 1] suffering from medial compartment OA of the knee between 2007 and 2013 using the focal dome osteotomy with the fixator-assisted plating (FAP) method. Of 31 patients, 21 were women who did not need the external fixator treatment. Of 31 patients, 24 were above the age of 55 years (33-70 years). There were 17 right and 17 left knees. 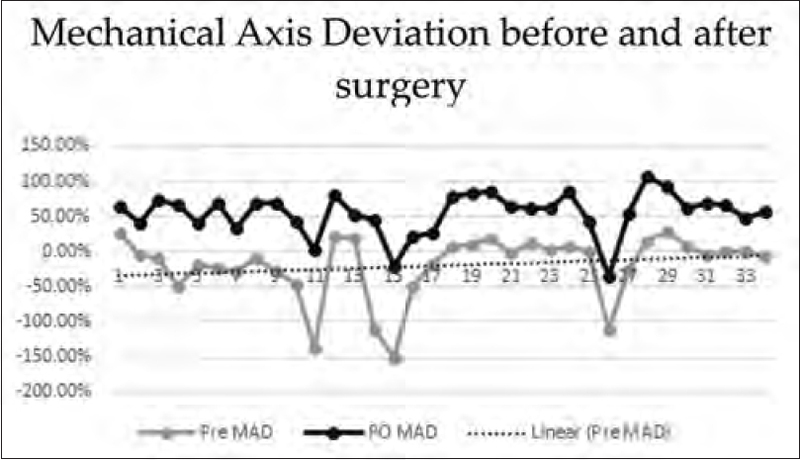 The average preoperative mechanical axis deviation (MAD) as measured on full-length X-rays was -19%. In only 12 of the 34 limbs, the mechanical axis passed through the knee joint. In the remaining 22 limbs, the Mikulicz line passed from 0% to -150% [Figure 1]. The average preoperative medial proximal tibial angle (MPTA) was 79.8° (88°-63°). The average preoperative hip-knee-ankle (HKA) angle was 195.2° (185°-225°) and femorotibial angle (FTA) was 184.6° (182°-220°). Three patients had Grade 2 Kellgren-Lawrence (KL), 15 had Grade 3, and 17 had Grade 4 KL arthritis on radiological scoring. Of 34 patients, 23 had patellofemoral arthritis. The patients were all given a trial of conservative therapy for a minimum of 3 months before they were offered surgery. They were all treated with a focal dome osteotomy fixed with a Lateral TomoFix plate assisted by a hybrid Ilizarov external fixator. The average duration of follow-up was 70.9 months since surgery (45-113 months). The patient is placed supine on a radiolucent table. We start by approaching the fibula laterally and by resecting a 10-15 mm segment. We use a hybrid Ilizarov or external fixator as an intraoperative alignment tool for the dome osteotomy. Two 4 mm × 3 mm half pins fix the proximal fragment. The first pin is anteroposterior, parallel to tibial slope, close to the joint. The second one is inserted posteromedially in the tibial head. These are attached to a carbon fiber ring at joint level which does not block visualization of the osteotomy on X-rays. We expose the upper tibia by subperiosteal dissection. A jig is used to drill holes in a small arc with a 2 mm or 3.2 mm drill bit. The center of rotation of angulation is above the tibial tuberosity, and the arc has its center on it. Convexity of the arc faces distally at lower part of the tuberosity. The medial and lateral borders of the arc are just above the tuberosity. A thin, sharp osteotome connects these holes to complete the arcuate osteotomy. Take care not to cause comminution of the posterior cortex. Manually translate the distal fragment laterally by a single cortex width. Connect the rings with multiplane hinges, distract the medial, and compress the lateral connections to achieve valgus. A cautery cord test or long leg X-rays are done. Adjustments ensure the mechanical axis passes at outer border of lateral tibial spine. Aim for 62% of the joint width if long leg films can be exposed and measured. When alignment is satisfactory, the hinges are locked. The osteotomy is held stably by the fixator. Apply a TomoFix plate on the lateral side with 4 screws in the proximal fragment and 3 in the distal. Partial weight bearing is started on the 2 nd day [Figure 2]. All osteotomies united. There were no fixation failures. None needed bone grafting or graft substitutes. One patient developed a fracture distal to the plate 1 year after the osteotomy united. This was fixed with a plate which developed an infection after the fracture healed. The plate was removed, and debridement and antibiotic cement beads were inserted. One patient developed partial wound dehiscence due to prominence of the plate which healed with daily dressings. The average post-operative MAD [Table 2] was 55% (3% to 108%). 14 of 34 (41.1%) were within 50 to 70% of width of the joint. (presuming that some patients had dynamic varus, which needed more than the usual target of 62% of the joint width). 6/34 (17.6%) were mildly undercorrected till 40% joint width. 2/34 (5.8%) were mildly overcorrected to between 70% and 80% joint width. 6 of 34 (17.6%) were significantly overcorrected (>80% joint width). 6 of 34 (17.6%) were significantly undercorrected to less than 40% joint width [Figure 3]. The postoperative MPTA averaged 93° (84°-107°). Hip Knee Ankle angle HKA [Table 3] averaged 177.5° (166 to 204°). However, 10 of 34 patients had undercorrection of HKA less than 177° and eight of 34 had overcorrection of more than 6°HKA angle (174°). Hence only 16/34 or 47% had the ideal correction. The average Femoro-Tibial Angle [Table 4], FTA was 172°(158 to 184°). Considering 8 to 12° of valgus (FTA of 172 to 168) as ideal, only 8/34 (23.5%) had an excellent correction. Considering 12 to 16° valgus FTA (168-164°) 10/34 (29.4%) had mild overcorrection. 2/34 (5.8%) had significant overcorrection. Considering 4 to 8° as mild undercorrection (FTA=176 to 172°), 10/34 (29.4%) had mild undercorrection. Considering 4° valgus to 4° varus (FTA 176 to 184), 5 of 34 patients (14.7%) had moderate undercorrection. 2/34 (5.8%) were severely undercorrected. The mean Femoro Tibial (FTA) deformity corrected was 17.3° (9.4 to 36°). The mean HKA (Hip Knee Ankle) angle was corrected to a mean of 18.5 degrees (8 to 35°). There was a 4.12° change in the tibial slope (95%CI=-5.89 to -2.49). Preop Posterior Proximal Tibial Angle (PPTA) was a mean of 76.90° and Post Op was 81.1° (two tailed P < 0.0001). (calculated using Instat GraphPad Prism3.0, La Jolla, Ca. USA) [Figure 4]. 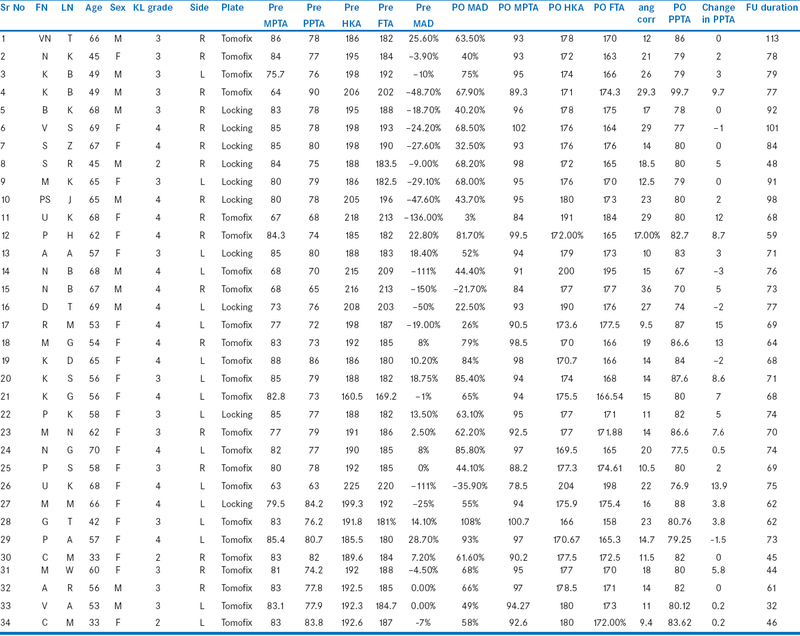 All P values are given in [Table 5]. Bone neither needs to be removed nor a wedge opened with a dome osteotomy. A large deformity can be corrected while retaining bony contact. The Maquet dome osteotomy  done above the tuberosity can correct a large deformity but results in a very small proximal fragment that is difficult to fix adequately. It also results in medial translation of the distal fragment, which partially negates the lateral translation of the mechanical axis achieved by valgus angulation. The focal dome osteotomy ,, overcomes all of these problems. The osteotomy translates the distal fragment laterally. This aids the mechanical axis translation toward the lateral compartment. There is enough bony stock for stable fixation either with an external fixator or with a locked plate. Gradual correction of upper tibial varus is popular but fixator time can be long and can inconvenience the patient. Gradual correction of varus in adolescents using the Ilizarov fixator took an average of 24 weeks for Park. Older patients have less tolerance to the fixator. A dome osteotomy can correct a large varus acutely and without losing bony contact. We did achieve the objective of correcting large varus deformities with the convenience of locked plating. However, the accuracy of correction was moderately good. The use of a Lateral Tomofixγ or a locking plate has not been described for a dome osteotomy. The dome osteotomy creates lateral translation and a step. Using a locking plate gives stable fixation and retains this desirable translation. Only three screws may fix the distal fragment stably to allow full weight bearing mobilization. A full-length cassette and portable X-ray machine with a large tube to film distance could help accurately measure the correction and achieve more accuracy. However, there are difficulties in implementing this system as it needs a very long tube head to film distance. Operation Theatre ceilings are not high enough and portable X-ray machine tube head height rarely exceeds seven feet. The operation table rarely goes below 34". We did get a custom-made X-ray machine with a tube height of 10 feet. However, we did not have a portable long irridescent phosphor (IP) or computerized radiography cassette. All our preoperative and postoperative full-length X-rays were taken on a Carestream Kodak wall mounted system since 2010. Long leg radiography was performed in the operation theatre with the older film radiography 14" × 51" cassette on 5 patients. Two of the five patients had a correction within 10% of the ideal mechanical axis. The difficulties enumerated above forced us to go back to the cautery cord test. We did obtain a 34" long IP cassette in 2013, but the 100 mA portable X-ray machine was unable to generate the factors needed for proper exposure of the film. After the analysis of these patients, we are pursuing long leg radiography in the operation theatre by trying to obtain a 300 mA portable X-ray machine with a 10 foot tube height as well as an operation table that can go significantly below 34". These errors may have caused overcorrection of more than 12° of femorotibial valgus in 10 of the 34 segments (29.4%). More than 15° of valgus was seen in 3 of the 34 limbs (8.8%). More than 15° valgus may be unacceptable and may lead to early degeneration of the lateral compartment. However, progression of arthritis in lateral compartment is multifactorial and is accelerated by preexisting meniscal damage. Koshino et al. recommends 10° of FTA as ideal. Many patients have dynamic varus  which needs correction. Externally rotating the distal fragment aids in lateral translation of the mechanical axis. Hinterwimmer showed internal rotation of 4.4° ± 2.8° seen in medial opening-wedge osteotomies. This internal rotation negates the desired lateral shift of mechanical axis. A dome osteotomy which creates a mild external rotation is possibly more beneficial. A Taylor spatial frame (TSF) fixator can help avoiding some errors. However, positioning for radiography and programming can lead to excess tourniquet time. Our results could have improved with the TSF fixator, albeit at a higher cost. However, during the study, the TSF Fixator (Smith and Nephew, Gurgaon, India) was not commercially available. In a medial opening-wedge osteotomy where lateral shift of mechanical axis is achieved by angulation, large varus corrections can have deleterious effects on ankle joint contact pressures. The dome osteotomy achieves the lateral translation of the mechanical axis without placing angular stresses on the ankle. Our study has several limitations. We have not measured patient-reported outcome measures. That will be the subject of future study, especially to analyze if the results are long lasting and if there is a correlation between radiological results and patient-reported outcome measures. There is no control. However, an earlier study compared the radiological results of the dome osteotomy treated with lateral locked plating versus the dome osteotomy treated with the Ilizarov fixator. There were more women, older patients and larger varus deformities in the group treated with plating (FAP) [Table 6]. 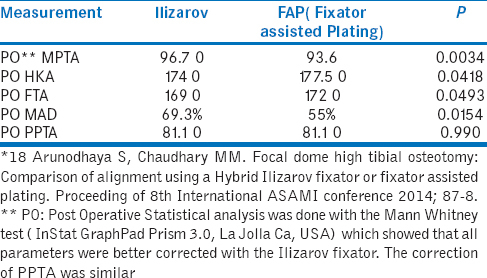 The Ilizarov fixator group achieved more valgus (68% MAD vs. 53.1% MAD in the FAP group). This could be a reflection of better correction of dynamic varus. No blood transfusions were needed in the ilizarov group. There were no re-fractures and no deep infections. Fixator duration was an average of 14 weeks (12-18 weeks). Many studies with plating of medial opening-wedge osteotomies have shown more accurate results. However, the deformities were smaller. Other studies have achieved accuracy with gradual correction. Our patient cohort refused external fixation and we had to attempt accuracy despite the lack of having a TSF fixator or proper long leg radiography. Our study may not have universal appeal as we treated much older patients with higher KL grades of OA with corrective osteotomies. This reflects the choices made by patients in our geographical location, based on financial and cultural considerations. For large extra-articular deformities, the FAP of focal dome osteotomies offers moderately good accuracy with convenience of definitive internal fixation. The accuracy of this method could be improved using a TSF fixator and using long leg radiography in the operation theatre. Fixator assisted plating enables correction of large varus deformities in medial compartment osteoarthritis. A focal dome osteotomy performed at the level of the tibial tuberosity allows large corrections aided by an intra-operatively placed fixator. A lateral Tomofix or locking plate holds the fixation till reliable union. Accuracy of correction can be improved by using a TSF or similar fixator or by long leg radiography in the operation theatre. The author would like to acknowledge the contributions made by Madhavi Modak in the preparation of the manuscript. Coventry MB, Ilstrup DM, Wallrichs SL. Proximal tibial osteotomy. A critical long-term study of eighty-seven cases. J Bone Joint Surg Am 1993;75:196-201. Song EK, Seon JK, Park SJ, Jeong MS. The complications of high tibial osteotomy: Closing- versus opening-wedge methods. J Bone Joint Surg Br 2010;92:1245-52. Tunggal JA, Higgins GA, Waddell JP. Complications of closing wedge high tibial osteotomy. Int Orthop 2010;34:255-61. Lee DH, Ryu KJ, Kim JH, Soung S, Shin S. Fixator-assisted technique enables less invasive plate osteosynthesis in medial opening-wedge high tibial osteotomy: A novel technique. Clin Orthop Relat Res 2015;473:3133-42. Paley D. Osteotomy Concepts and Frontal Plane Realignment. Principles of Deformity Correction. Ch. 5. Berlin, Heidelberg: Springer-Verlag; 2002. p. 99-154. Maquet PG. Biomechanics of the Knee: With Application to the Pathogenesis and the Surgical Treatment of Osteoarthritis. 2 nd ed. New York: Springer; 1984. Koshino T, Saito T, Orito K, Mitsuhashi S, Takeuchi R, Kurosaka T. Increase in range of knee motion to obtain floor sitting after high tibial osteotomy for osteoarthritis. Knee 2002;9:189-96. Christodoulou NA, Tsaknis RN, Sdrenias CV, Galanis KG, Mavrogenis AF. Improvement of proximal tibial osteotomy results by lateral retinacular release. Clin Orthop Relat Res 2005;441:340-5. Maralcan G, Kuru I, Issi S, Esmer AF, Tekdemir I, Evcik D. The innervation of patella: Anatomical and clinical study. Surg Radiol Anat 2005;27:331-5. Nagi ON, Kumar S, Aggarwal S. Combined lateral closing and medial opening-wedge high tibial osteotomy. J Bone Joint Surg Am 2007;89:542-9. Floerkemeier S, Staubli AE, Schroeter S, Goldhahn S, Lobenhoffer P. Outcome after high tibial open-wedge osteotomy: A retrospective evaluation of 533 patients. Knee Surg Sports Traumatol Arthrosc 2013;21:170-80. Atrey A, Morison Z, Tosounidis T, Tunggal J, Waddell JP. Complications of closing wedge high tibial osteotomies for unicompartmental osteoarthritis of the knee. Bone Joint Res 2012;1:205-9. Hsu RW. The study of Maquet dome high tibial osteotomy. Arthroscopic-assisted analysis. Clin Orthop Relat Res 1989;243:280-5. Paley D. Principles of correction for monocompartmental arthritis of the knee. In: Brown TE, Cui Q, Mihalko WM, Saleh KJ, editors. Arthritis and Arthroplasty: The Knee. Ch. 4. Philadelphia: Saunders Elsevier; 2009. p. 37-61. Watanabe K, Tsuchiya H, Sakurakichi K, Matsubara H, Tomita K. Acute correction using focal dome osteotomy for deformity about knee joint. Arch Orthop Trauma Surg 2008;128:1373-8. Arunodhaya S, Chaudhary MM. Focal Dome High Tibial Osteotomy: Comparison of Alignment Using a Hybrid Ilizarov Fixator or Fixator Assisted Plating. Proceeding of 8 th International ASAMI Conference; 2014. p. 87-8. Park YE, Song SH, Kwon HN, Refai MA, Park KW, Song HR. Gradual correction of idiopathic genu varum deformity using the Ilizarov technique. Knee Surg Sports Traumatol Arthrosc 2013;21:1523-9. Koshino T, Takeyama M, Jiang LS, Yoshida T, Saito T. Underestimation of varus angulation in knees with flexion deformity. Knee 2002;9:275-9. Hernigou P, Medevielle D, Debeyre J, Goutallier D. Proximal tibial osteotomy for osteoarthritis with varus deformity. A ten to thirteen-year follow-up study. J Bone Joint Surg Am 1987;69:332-54. Andriacchi TP. Valgus alignment and lateral compartment knee osteoarthritis: A biomechanical paradox or new insight into knee osteoarthritis? Arthritis Rheum 2013;65:310-3. Koshino T, Morii T, Wada J, Saito H, Ozawa N, Noyori K. High tibial osteotomy with fixation by a blade plate for medial compartment osteoarthritis of the knee. Orthop Clin North Am 1989;20:227-43. Andriacchi TP, Lang PL, Alexander EJ, Hurwitz DE. Methods for evaluating the progression of osteoarthritis. J Rehabil Res Dev 2000;37:163-70. Hinterwimmer S, Feucht MJ, Paul J, Kirchhoff C, Sauerschnig M, Imhoff AB, et al. Analysis of the effects of high tibial osteotomy on tibial rotation. Int Orthop 2016;40:1849-54. Rozbruch SR. Fixator assisted plating of limb deformities. Oper Tech Orthop 2011;21:174-9. Staubli AE, Jacob HA. Evolution of open-wedge high-tibial osteotomy: Experience with a special angular stable device for internal fixation without interposition material. Int Orthop 2010;34:167-72. Suero EM, Sabbagh Y, Westphal R, Hawi N, Citak M, Wahl FM, et al. Effect of medial opening wedge high tibial osteotomy on intraarticular knee and ankle contact pressures. J Orthop Res 2015;33:598-604. Teramoto T. Controversy of high tibial osteotomy. J Limb Lengthening Reconstr 2015;1:38-41.